Today is Groundhog Day which, in my world, is the anniversary of when I proposed to my wife more than a quarter century ago. (Yeah, I could have waited until Valentine's Day to pop the question - but I like being different) . That being said, this is an appropriate day for me to post this story about a pair of wedding gifts we were recently commissioned to make. Several months ago I received an email from a young man named "A", inquiring about the possibility of having a Valet Stand custom made for him. Apparently "A" found my Gentleman's Valet Cabinet online during a Google search, but it wasn't quite what he was looking for. In the ensuing weeks we exchanged sporadic emails discussing design, woods and finishes - and I roughed out a conceptual sketch along with preliminary pricing. All of this was easy to do using digital technology and email. Shortly after my emails began with "A" I received another email - this time from a young woman named "R". "R" told me she was the fiance of "A", and she was aware that "A" really loved some of my furniture pieces. With that in mind "R" asked about the possibility of commissioning a unique wedding gift specifically for her future husband. 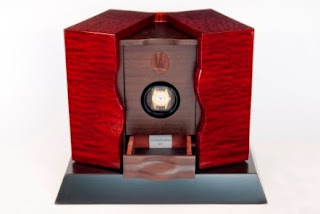 That led to a whole separate series of discussions which ultimately resulted in a custom watch winder box being made. 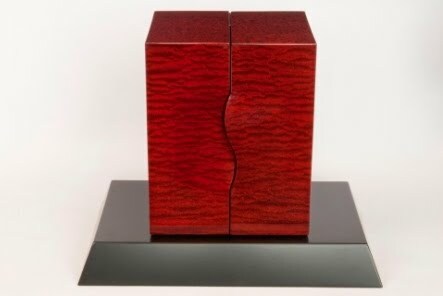 From "R" I learned that "A" really loved the split shell design of my Andiroba Armoire, and since I had already used a variation of this concept on the Pedestal Jewel Box (see earlier post) , this became the starting point for the watch winder box design. The exterior split shell was crafted from a highly figured sampling of Pommelle Sapele, which was finished in a deep Merlot stain to enhance the grain. 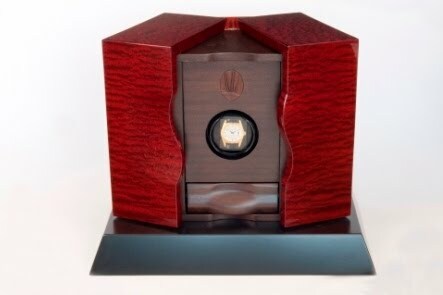 The box interior was finished in a satin Chestnut mahogany, with an inset panel to house the watch winder mechanism and a small drawer for accessories. To personalize the design even further we decided to inlay a small medallion of hand carved Black Walnut, which was shaped to emulate the silhouette of the actual tree that "A" and "R" got engaged under. Renowned wildlife artist Ron Richards was commissioned to make this specific carving. The making of this watch winder box was well under way when I received a call from "A" telling me that he was engaged to be married and he wanted to commission a special wedding gift for his bride-to-be. "This is cool" I thought - to have a bride and groom each commission a special wedding gift for the other, with neither aware that they both dealing with the same craftsperson. In this case "A" wanted to present "R" with gifts of rare wine and fine champagne, in specially made presentation boxes that were uniquely hand carved with their initials, wedding logo, and dates of their upcoming 10th, 20th and 30th wedding anniversaries. 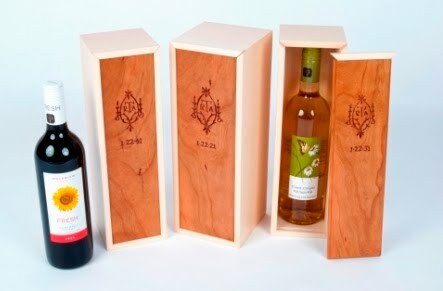 The boxes themselves were crafted from solid maple with mitred corners, with sliding panels made of solid cherry. After the reliefs were carved into the faces of the sliding panels, everything was finished in a protective lacquer and a special glaze was applied by hand to accentuate the carved details. Each gift was individually packed and shipped - each to a different address. The wedding day came and went, and not a word was heard from either "A" or "R". Under the circumstances I knew they were busy with other things, so I assumed that no news was good news. Then yesterday, out of the blue, "A" called to let me know how the exchange of gifts went. The gift of the wine and boxes apparently went over very well, because "A" said that "R" and her bridesmaids were all crying tears of joy over it. When "A" received his gift he said he wasn't sure what it was at first. But as soon as he pulled open the split shells he said he knew exactly what it was and who had made it - and he was totally delighted with the result. Two happy customers at the same time. How perfect is that? 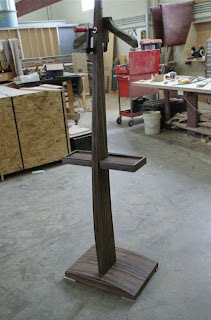 Meanwhile, the Valet Stand that started this process is now almost done. (It's taking a little longer than expected, because a couple of rush orders ended up taking priority) . But it's all good. ps: That valet stand's looking pretty good too! We're thrilled that you both loved the finished results. Although the watch winder delivery went like clockwork (pun intended), we got a little worried about whether the wine boxes package would make it in time. Thankfully it all worked out.